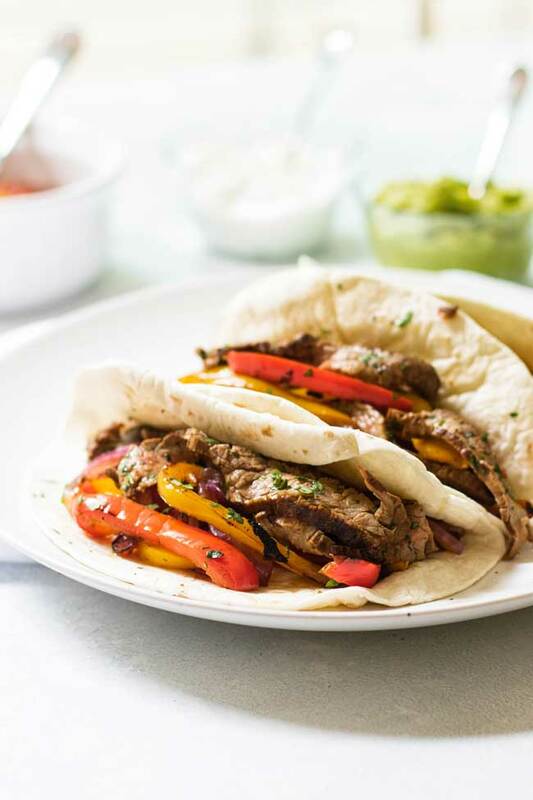 Go out for fajitas or make them at home? 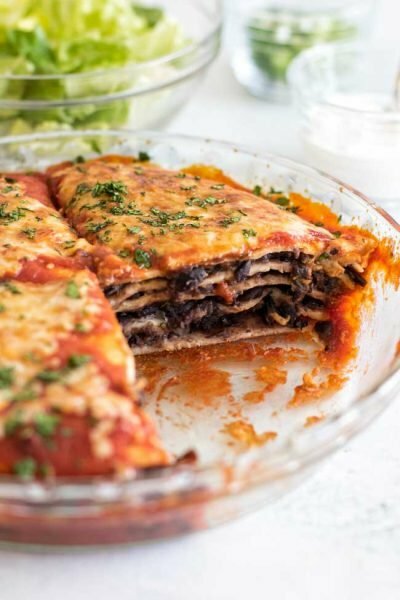 Make them at home, I say, because once you see how easy it is you’ll want them every week – no waiting for a table at your local Mexican restaurant required. 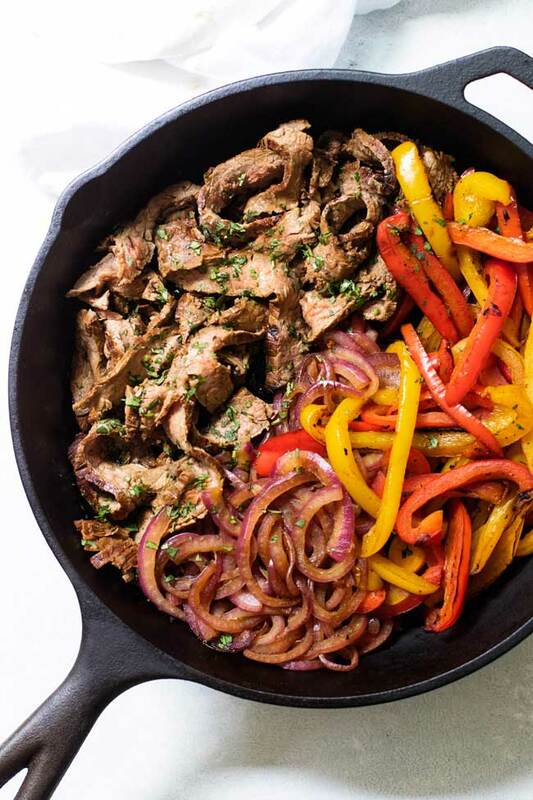 There’s a lot to love about beef fajitas – a sizzling hot platter filled with juicy steak, tender red onion, and colorful bell peppers – and knowing how to make them means you have an easy dinner idea that easily scales to serve a few or crowd of your favorite people. It all starts with the beef. Traditional recipes call for skirt steak or flank steak, but I use chuck eye roast. It’s less expensive compared to skirt and flank steak and I find it tastes just as good. Whichever cut of beef you decide to use, be sure to marinate it first. It requires some advanced planning, but the marinade – made with olive oil, soy sauce, a little honey, garlic, spices, and white wine vinegar – takes all of five minutes to pull together in the morning. Add the beef and let it marinate in the refrigerator until you’re ready to make dinner. If you’ve ever ordered fajitas in a restaurant you know the thrill when a sizzling hot platter arrives at the table. 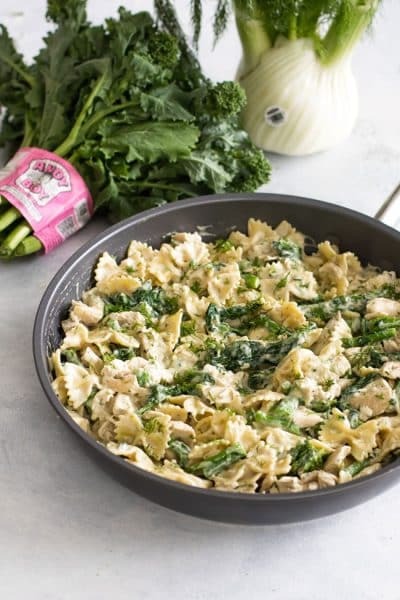 You can recreate that effect at home with a cast iron skillet, but if you don’t have one I’ve included instructions for using a regular non-stick skillet in the recipe. Once you’re ready to cook be sure to prep all the vegetables beforehand. The beef cooks first and doesn’t take long, so you’ll want to be ready with the bell peppers and onions. They cook in the browned bits left behind by the beef giving them lots of flavor. 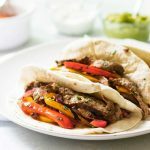 These beef fajitas are easy to prep, but the beef needs at least a couple of hours to marinate. 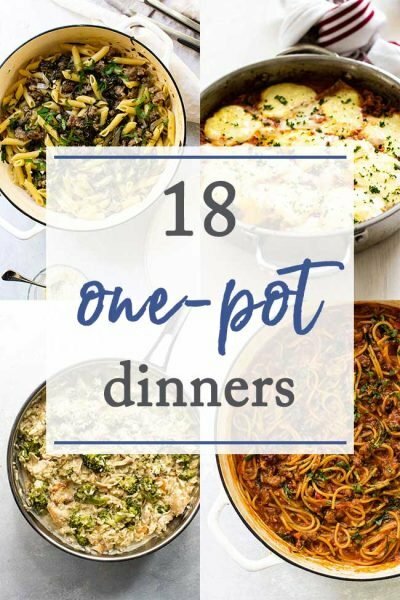 All together it takes about 20 minutes to prep it all and about 20 minutes to cook making this an easy weeknight dinner. This recipe serves two hungry people. Combine the olive oil, soy sauce, vinegar, honey, garlic, oregano, cumin, and pepper in a large resealable freezer bag. Place the beef in the bag, seal, and then smush it around in the marinade to coat it evenly. Place the bag in the refrigerator for up to 12 hours. Heat a cast iron skillet (see note 2) over medium heat. Pat the beef with paper towels to absorb excess marinade (it will help the beef sear). Once the pan is hot, cook the beef until nicely seared on the first side, about 5 minutes. Flip the beef over and let it sear on the other side. Check the temperature with a meat thermometer and once it reads 130-135 degrees, remove the beef from the pan. Let it rest on a cutting board while you prepare the vegetables. Cook the bell peppers and onions in the same pan as the beef until softened, about ten minutes. 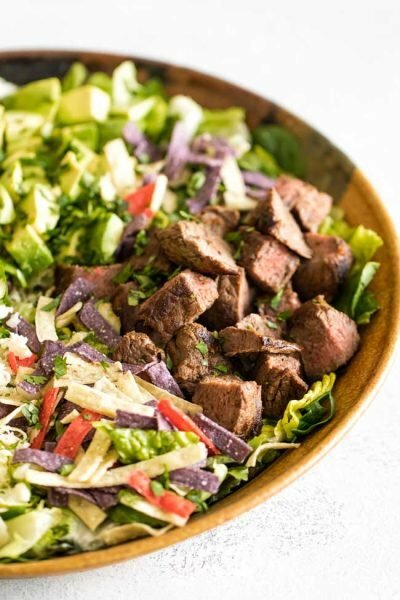 While the vegetables cook, slice the beef against the grain into thin slices. Once the vegetables have cooked, add the sliced beef back in (along with the juices on the cutting board. Add the chopped cilantro and toss it all together. Note 1: If you can’t find chuck eye roast, substitute flank steak or skirt steak. I bought a 1-pound piece of beef and cut it in half. 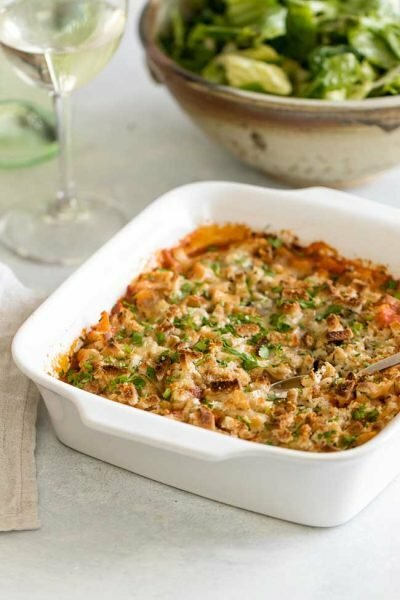 I used one-half for this recipe and froze the second piece to use later. Note 2: If you don’t have a cast iron skillet you can use a large non-stick skillet. If you do, heat 1 tablespoon of vegetable oil in the skillet before adding the beef. 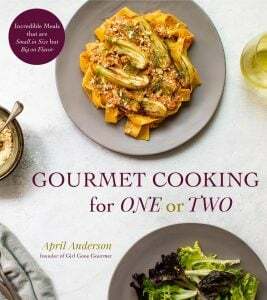 Post, recipe, and photos updated from the archives. First published July 2009.